Hello! Today I am on day 24 of the 31-day challenge, and the prompt is "inspired by a book". I am somewhat ashamed to say I am not reading as much these days--I had to leave my collection behind in the move, and I don't have it here yet!--but I did know which book I wanted to use for this. The Catcher in the Rye is a book a lot of us had to read in school, and many people at that age don't like it. I didn't hate it, but most of the meaning didn't sink in at that age. Going back over it, I see Holden Caulfield's world through the eyes of a troubled teen--dealing with the usual rebellion and cynicism of a boy his age, coupled with what some sources suggest are symptoms of PTSD. Coupled with the fact that he is a reflection of the author himself, and the book provides a lot of insight into the mind of J.D. Salinger. I guess what I'm trying to say is, if you read this as a teenager and didn't like it, go back and read it again. ANYWAY. Nails. That's why we're here! As you can see, my mani was inspired by the book cover. 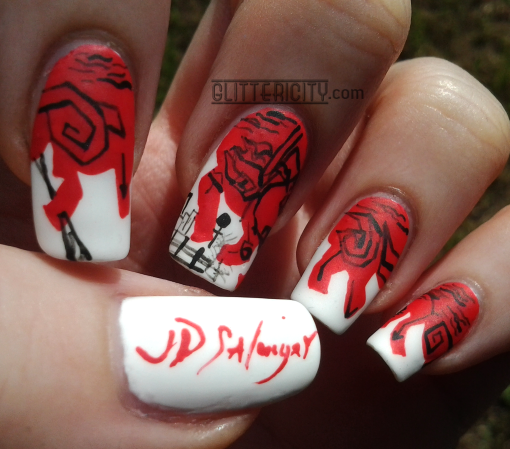 The white polish I laid down first is Orly Pointe Blanche, and the red and black are both acrylic paint. 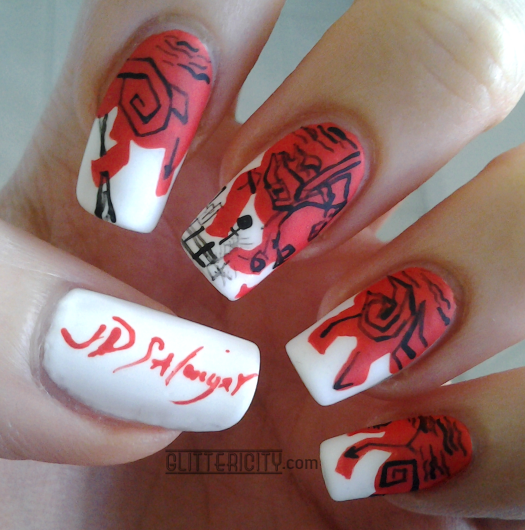 I tried to capture the stylised horse from the cover on my middle nail, but it only sort of worked. The rest of the nails are just doodles that match. On the thumb, I looked up Salinger's signature and tried to copy it as best I could. 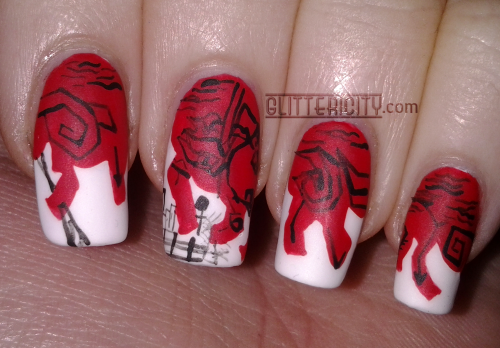 It's actually a lot more widely-spread than this, but I didn't have room on the nail to do it proper justice. I did try to represent the shapes of the letters accurately. I sealed it in with Orly Sec 'N Dry topcoat, and then added OPI Matte Top Coat to make it look even more like the book cover. It hasn't been very sunny here lately. This is as bright as I could get! I hope you like these! I enjoyed painting them and really wish I could have worn them longer. I think they're extraordinarily cool.